It's KaKashi here from Kakashi's Corner. 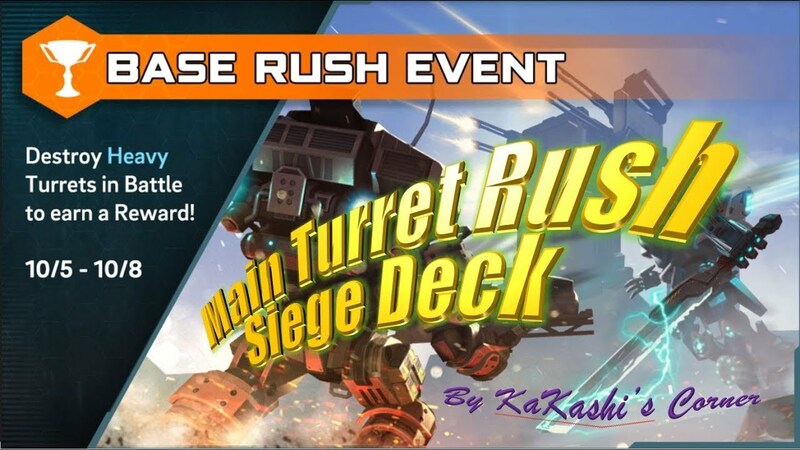 Today I’m doing a guide on rushing the main turret with a siege deck. It is not a strategy I am familiar with but wanted to get the tier 3 reward of the Main Turret Rush Destruction event. I had a lot of fun with this deck and realised the games don’t last very long before I win. I have had a good win ratio with this deck after I have figured out how to play the cards. The stars of this deck are the mortar ogre, core ogre, drones, smoke stryder and the gunner pilot - supported by cards such as sentries, rocket grunts and Jack Cooper. The mortar ogre is a very good at catching the enemy off-guard. If you drop him on a spot out of harm’s way he can do tons of turret damage by chipping away at its health without the enemy paying any attention to him as he is not an immediate threat to any of the enemy units in battle. Generating very little threat, he sieges from a very far distance and by the time the enemy wakes up to deal with him he soaks up a ton of damage with his shield and massive health pool. I picked the smoke stryder for this deck because of the high robotic dps which counts towards structures and because I am expecting a lot of counter heavy titans for the event. The other reason the smoke stryder works well in this deck is because he is great at clearing and defending hardpoints against enemy pilots and especially grunts with his AOE smoke rally point ability relieving pressure from enemies playing the hardpoints. I also found him to be a great counter to enemy drones which are very popular in any deck at the moment. The drones in this deck is a card that I use in almost any deck regardless of the overall strategy. It is a very powerful card which excels in this deck because of the massive robotic dps shredding titans, structures and the holo grenadier’s decoy. I think 2 sets of drones are enough to take down one of the secondary turrets and clearing the path to victory. They are also crucial for remote hardpoint tanking to secure a good point lead in the early game. They are also great for taking out expensive non ranged titans such as core scorch and core ogre. The big boy of this deck is the core ogre which is unstoppable if you set up the right conditions for his deployment. The setup you should be playing for is to take down one of the secondary turrets to expand the space where you can drop titans. As soon as the secondary turret falls you have to drop his as far as possible in the frontline and as close as possible to the main turret. This puts the enemy under immense pressure to defend as core ogre is slow but packs a massive punch and can soak up just as much punishment. The gunner had some great moments in this deck for me as I have some tanky titans and sentries buying time for the gunner to wind up his attack speed and melt the anything he lays his sights on especially if they have high health pools such as turrets and titans. Jack Cooper plays an important role in this deck as it is important to keep on capturing and defending hardpoints accumulating points while the battle is being fought on multiple fronts. He should be Capturing and defending hardpoints with sentries while your titans are pushing down the turrets in the frontline with drones. With this deck it is important to put a lot of pressure on hardpoints while chipping away at turrets and to know where the closest spots are to the main tower to deploy your core ogre as soon as the secondary turret falls. Please enjoy the footage in the video of me winning with this deck and have fun!